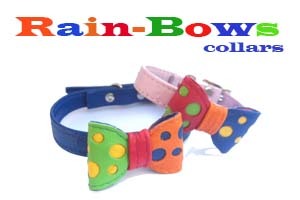 Always bright and cheerful, tallulah created this loud and proud collar! Inspired by the fashion favourite, we have created our own ZigZag collar. This collar epitomises the fashion giants geometric genius! Choose your own base colour and top colour to create your own designer piece. 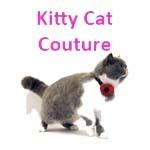 ..we Love a Bow collar here at Tallulah Couture. To show you how much, we've covered our Bows in hearts. 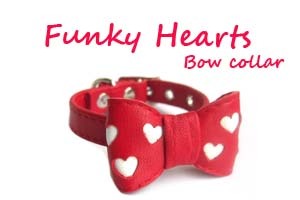 You can choose the collar and bow colour and choose a contrasting colour for the hearts. 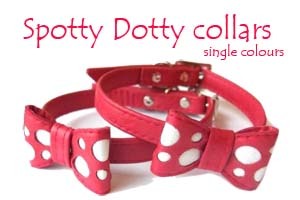 These fantastic collars are available in so many different colourways, you'll be spoilt for choice! 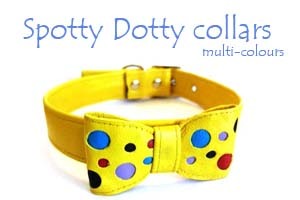 Choose the collar colour and add multi coloured Spotty dottys for a vibrant and fun look. 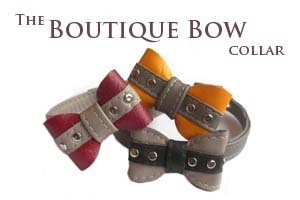 You can mix and match leather colours as we make everything to order. 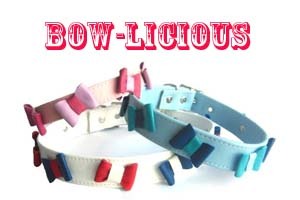 Our bow collars have just gone Bow-licious.. not content with one bow, we've added lots!!! or if you fancy something different ...choose your own mix and match colours. 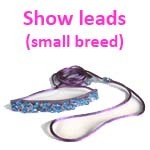 This elegant collar is available in any of our beautiful leather colours. We will then embellish the bow with diamond Swarovski crystal rivets. A statement collar if ever we saw one! Inspired by every girls favourite accessories...shoes and bags. We have take the popular riveted detail found on so many fashionable favourites and incorporated them into our Boutique Bow design. 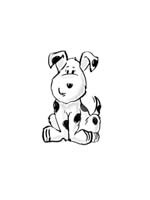 Choose from silver or gold metallic leather for the spotty dottys. 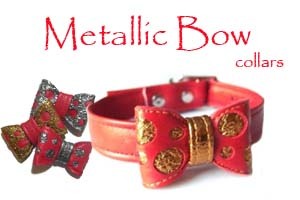 Great party collars and when you really need a little extra shine!